Most companies know they need to deliver an outstanding customer experience (CX)—or they risk losing customers and revenues. Fostering a customer-centric culture is on the must-do lists of many top organizations. Still, shifting from the legacy business mindset that put numbers above people isn’t always easy. Some industries have gotten CX right, but most still have a long way to go. The communications industry is one of those that hasn’t made its mark as a customer experience (CX) leader. 2015 saw the telecommunications industry receiving the second-worst overall CX—behind government agencies. 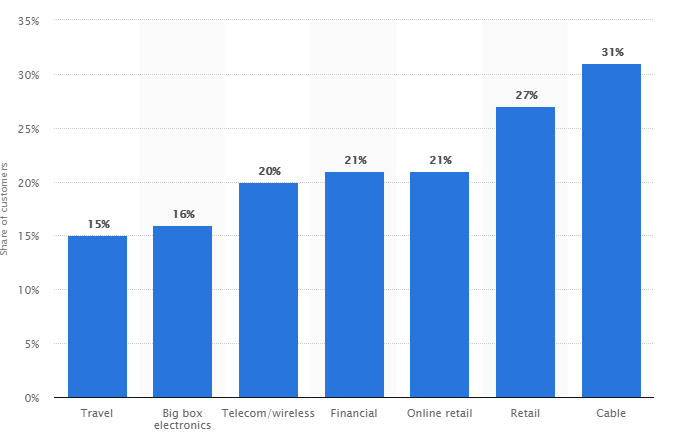 More recently, the telecom, wireless, and cable industry received attention for having some of the highest churn rates in a cross-industry study. Another data point: in the most recent Temkin Experience Ratings (TxR), wireless companies earned an “okay” rating. Clearly, the communications industry has significant work to do in CX. One communications service provider is leading the way. The company—one of the top five largest telecommunications providers in the world–has made a commitment to gathering and acting on CX feedback. It has seen impressive results—including a turn-around in less than a year of a region with low CX scores. After recognizing capturing customer feedback was especially critical to the success of new national product rollouts, the company decided to partner with eTouchPoint. Initially, they implemented our CX platform solution for several large regions, with up to 5,000 field service employees. After initial success in the early adopter regions, another large region – “Region B”—decided to use eTouchPoint to launch a CX survey practice. Previously, the organization had generic and uncoordinated customer feedback collection processes. Unhappy customers could search out to executive contact information via the main company website—or share complaints with local dispatch centers. As a result, most customer concerns never surfaced, which made regional leadership believe their front-line team of 2,000+ was performing well. Initial survey results told a far different story. Customer feedback was much poorer than expected—and lower than the benchmarks established by peers in other regions. Region B’s leadership gained clear understanding that their customers were not happy and their service team was delivering subpar experiences. This “wake-up call” made it clear that the organization needed better CX practices. Region B’s post-interaction CX surveys included both closed-ended feedback to provide quantitative analysis of customer experience and opportunities for VoC input. Leaders used the quantitative input in several ways. First, they established alerts, which would send an immediate email to a front-line supervisor if a customer left a poor CX rating. That way, managers knew right away if an employee had delivered a bad customer experience. In addition, Region B made front-line managers take ownership of remediating any customer concerns caused by their direct reports. Often, supervisors had to engage directly with disgruntled customers. Quickly, employees learned that they did not want their managers to have to follow up with customers. This inspired prompt, effective behavior changes. Front-line managers had ownership of closing out alerts—which motivated them to act to address customer concerns so that they could mark alerts closed. Regional leadership sent out regular reports, which featured alert rates by individual and manager along with closeout rates to intensify the team’s focus on continued performance improvement. Region B’s leaders also used VoC input in novel ways. The region’s VP chaired a weekly meeting to review customer experience deficiencies. Individual employees who had delivered subpar interactions often had to attend those meetings to discuss the situations. Leaders would play recorded customer complaints to show employees how their actions contributed to customer unhappiness. While Region B took clear steps to minimize negative customer interactions, its leaders accentuated the positive as well. They routinely shared news about positive customer feedback—including reporting on “perfect alerts,” in which technicians received top scores across the board from customers. This instilled a sense of healthy competition among employees and managers. Teams and individuals aimed for higher “perfect alert” rates to demonstrate their commitment to customer service excellence. This CX innovator’s journey is one every service-oriented company can follow. Leaders accepted that initial CX results sent a sobering message. Customers weren’t happy and they needed an avenue to voice their experiences. And they needed the organization to listen. Changing to a customer-focused culture was an imperative. Culture change is never easy. It requires a strong commitment from leadership and adoption of new processes by every member of the organization. The intense focus on customer performance improvements paid off. In less than a year after eTouchPoint began working with the organization, customer experience scores for individual employees increased dramatically. Customer ratings for 70% of employees shifted from just OK to outstanding in less than 12 months. 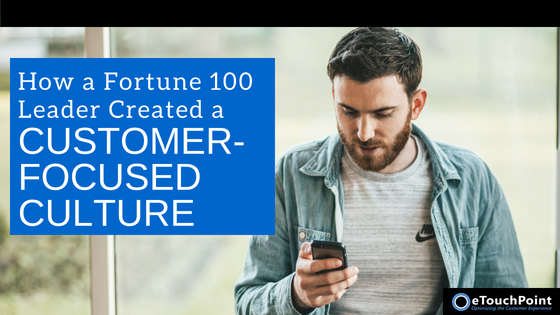 However, the Fortune 100 leader knows that customer experience is a moving target. In today’s connected world, customers have unprecedented access to information—and expect prompt resolution to every issue. 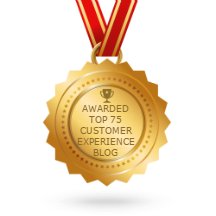 The company has made customer experience a core part of how they do business—and challenges its team to meet higher performance standards.